Holy crap, this book. THIS DAMN BOOK. I’m not crying, you’re crying. Seriously, I can’t even. I’m a mess. A quivering, sobbing mess. Everyone one of these Wounded Kingdom books has been a boatload of emotions, and King of Assassins was easily the most powerful and poignant of them all. I’ve traveled this long road with Girton, Merela, Rufra, Aydor, and the others, and after witnessing their trials and tribulations, finally being able to see it all culminate into this one big epic finale was both a little euphoric and cathartic. But first, a recap. The Wounded Kingdom is a trilogy of books that follows protagonist Girton Clubfoot, so-named because of his malformed foot, but if you think this causes him any kind of disability, think again. From a young age, he has been trained as an assassin by his master Merela, becoming quite an accomplished fighter. The entire series is told from the point-of-view of an older Girton, recalling the events of his past, with each book focusing on an important time in his life. As a result, the novels stand alone in that they each feature a self-contained story, but together they form a complete picture of the character’s evolution over a period of decades. As such, it would be worth it to read the full trilogy, and in order. This is definitely an epic fantasy trilogy you won’t want to miss, and it’s one that is best experienced fully. This does mean though that we’ve once again jumped forward in time in King of Assassins. Fifteen or sixteen years have passed since we saw Girton last in Blood of Assassin, and those of us who remember what a restless and volatile young adult he was would be happy to know that time gap has mellowed him somewhat, with age bringing maturity and more self-restraint. Now in his 30s, Girton has become a full-fledged assassin, and has even taken on an apprentice as his own. Still, as his friend King Rufra’s most trusted advisor, Girton’s main role these days often involves providing security and protection for the royal family. Together with his rival-turned-ally Aydor, the two of them have their hands full guarding the king and his wife and children, with the work only getting more difficult now that Rufra has set his sights on becoming the High King. The last guy who had the job died along with much of his city when it was ravaged by a deadly plague, and with no heirs, the throne now sits vacant. Those with aspirations to fill it will soon be gathered in Ceadoc where the decision will be put to a vote. While this was meant to prevent more bloodshed in a world already ravaged by war, apparently not everyone is so willing to play by the rules. On the way to the city, Rufra’s retinue is ambushed by an assassination attempt, which ends up being thwarted by Girton—though just barely. Someone out there is intent on keeping Rufra from his goals, and once more it is up to Girton to find out who. Like the first two installments, King of Assassins is an epic fantasy with mystery, action, adventure, and suspense elements. But fifteen to sixteen years is a long time, and many changes have occurred in Girton’s life. Many are not spelled out for us but are instead picked up in the subtle nuances in the conversations and interactions between the protagonist and the people closest to him. Of these, the most dramatic of all may be Girton’s relationship with Aydor. In case I didn’t make it clear in my review of the previous book, I am a huge fan of Aydor. And I didn’t think it was possible to make me love him even more than I already did, but this book managed to do it. Girton may be the star of this series, but hands down, Aydor has one of the best character arcs I have ever read. And then there’s Merela. Girton’s bond with her has always melted my heart. It’s a rarity these days in the genre to see a master-apprentice relationship filled with such nurturing love, support, encouragement and compassion. I’ve long gotten the sense that Merela’s role goes beyond that of teacher to Girton; she’s also a friend, counselor, and maternal figure, and this book lays it to rest. Our main character may be a grown man now, but seeing him look up to his old master with still so much fondness and respect is just so touching and fills me with warmth and joy. I was also very glad the author decided to include interludes that reveal more about Merela’s past in this one; I loved every moment where I got to read about the life of this incredible woman, even the heartbreaking and painful parts. Finally, no discussion of the story or characters would be complete without taking a look at Rufra. 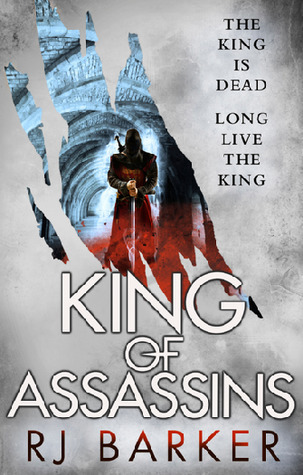 King of Assassins delivers heart-wrenching moments and emotional gut punches aplenty, but perhaps one of the most tragic aspects of this book is what has become of our protagonist’s relationship with his king. “He was my friend” was a remark that came up several times when Girton spoke of Rufra, and despite his unwavering loyalty, the implications of that sneaky past tense were never lost on me. While the two men still obviously mean a lot to each other, the tensions between them now are pretty much unmistakable. Power changes people, and even though Rufra is good person through and through, paranoia and the pressures of ruling have caused a divergence in his and Girton’s thinking. I emphasize the character relationships in this review because I truly believe the details surrounding them have everything to do with why the ending hit me so hard in the feels. In fact, I had figured out a big part of the mystery’s resolution very early into the book, but RJ Barker’s storytelling and character building is so riveting and complex that I took any flaws in the story in stride and simply devoured the rest of the pages in my hunger for more action and intrigue. Obviously, I also shed a lot of tears. The last couple of chapters completely destroyed me. I’ve followed these characters from the beginning, and they’ve been so masterfully written by Barker that it was impossible for me not be affected. Ultimately though, this series conclusion was oh so satisfying. Bottom line, King of Assassins put the perfect cap on a trilogy that has already been winning me over. This trio of books now represents one of the best, most extraordinary and delightful reading experiences I have ever had, and The Wounded Kingdom has shot up the ranks to become one of my favorite fantasy series of all time. It is truly a superb and dazzling achievement by RJ Barker, who debuted with Age of Assassins. His three novels now sit in a place of honor on the shelf where I put my most beloved reads, and trust me, they need to be on yours too. If you haven’t started this series yet, I highly recommend doing so, for it is an absolute must-read. For whatever reason, these just don’t sound intriguing to me. And it’s not just your reviews, as other reviews too have left me going “Man, this sounds like I’d like it but something isn’t quite catching”. I can understand that 😀 For what it’s worth, I like that these books are a mix of magic and mystery, but they still give me that down-to-earth vibe of traditional fantasy. Despite the emotional roller coaster this trilogy has been, it just makes me feel warm and fuzzy inside, like putting on a comfy old sweater. I definitely need to get on board with this series, clearly I’ve missed out! awesome! Now I want to try them too! I think you would have a great time with the first one! I can’t wait until you read this. I want to know what you think of the ending! Gosh, you nailed it. It was seriously so hard not to cry at the end of this one. I think I was just so floored by the ending, I couldn’t even cry. A seriously superb series, though, and I can’t wait to see what Barker comes out with next! Great review, Mogsy! Yeah, I know what you mean. Like, at the same time, I kinda saw it coming, but ugh, still! I wasn’t in no way prepared for how gutted I felt! Oh, I was completely floored. I didn’t see it at all! So kuddos to you for picking it up and figuring it out beforehand! Oh wow, sounds like this one really had an impact on you. Those are the *best* books. Glad you enjoyed it so much. For real! I had a major book hangover after finishing this. Books like this don’t come around often! Yeah, for real. I think that happens to me maybe once a year. I have really got to move this series up my priority list!! I love these books and can’t wait to read this. I’ve always liked the covers for the series and book 1 is on my wishlist!